During the opening of the 71st Session of the UN General Assembly (UNGA), member states and partners, including the Global Counterterrorism Forum, gathered in New York to explore ways of effectively preventing and countering violent extremism (P/CVE) and terrorism, among other pressing global challenges. 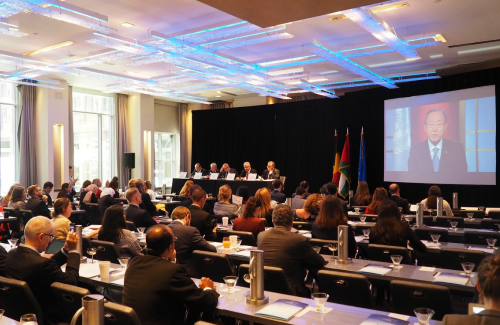 The Global Center hosted, supported, and participated in a number of these events, including a number of activities developed in partnership with the European Union (EU) through its Counter-Terrorism Monitoring, Reporting, and Support Mechanism (CT Morse). On 20 September 2016, the Global Center hosted a reception on the margins of UNGA, during which it launched the report "Blue Sky III: Taking UN Counterterrorism Efforts in the Next Decade from Plans to Action.” The report takes stock of a decade of multilateral activities to implement the UN Global Counter-Terrorism Strategy and analyzes the UN counterterrorism architecture and programs. It includes a critical analysis of the outcomes of deliberations around the 2016 review of the Strategy and reflects on implementation efforts going forward. On 22 September, the Global Center, through CT Morse, helped organize the event “Global Efforts in Integrating a Youth Dimension in Preventing and Countering Violent Extremism,” co-hosted by the EU and the governments of Belgium and Jordan. This high-level side event explored how to ensure that the voices and perspectives of youth are actively integrated in national, regional, and international P/CVE efforts. It also provided an opportunity for the in-depth exchange of views on ways to step up global attention to youth contribution to P/CVE through social media, governmental and UN programs, and youth-led initiatives. Following these and other events, on behalf of CT Morse, the Global Center, with input from the Institute for Security Studies, produced a brief report that provides a snapshot of the proceedings and main outcomes of the EU-sponsored activities held during UNGA in New York, and explores important opportunities that lay ahead to make the EU’s vision a reality. The report concludes with forward-looking recommendations to further increase the impact of the EU’s work in P/CVE sphere.